Very, very seldom is anyone ever caught in a long-term survival situation. A Robinson Crusoe scenario you might call it. Most rescues of individuals lost in the wilderness occur within seventy-two hours. So being able to make storage containers or gathering baskets is not a really important survival skill. It might be a fairly important skill in a post apocalyptic world where isolated communities might have to provide everything, including containers, for themselves. 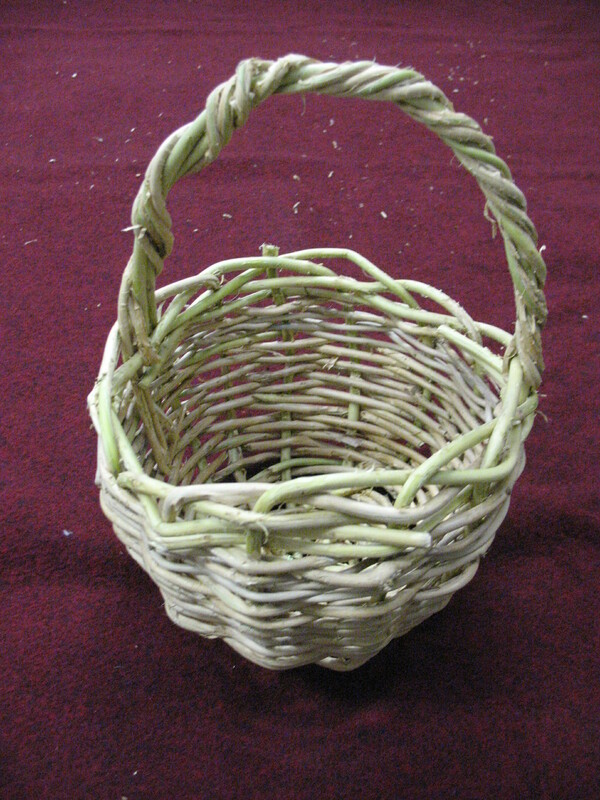 At any rate, basket making is a fun and relaxing skill and it does have some usefulness around the homestead. A nice basket is handy when harvesting produce from the garden or if you are out gathering wild berries or fruits. 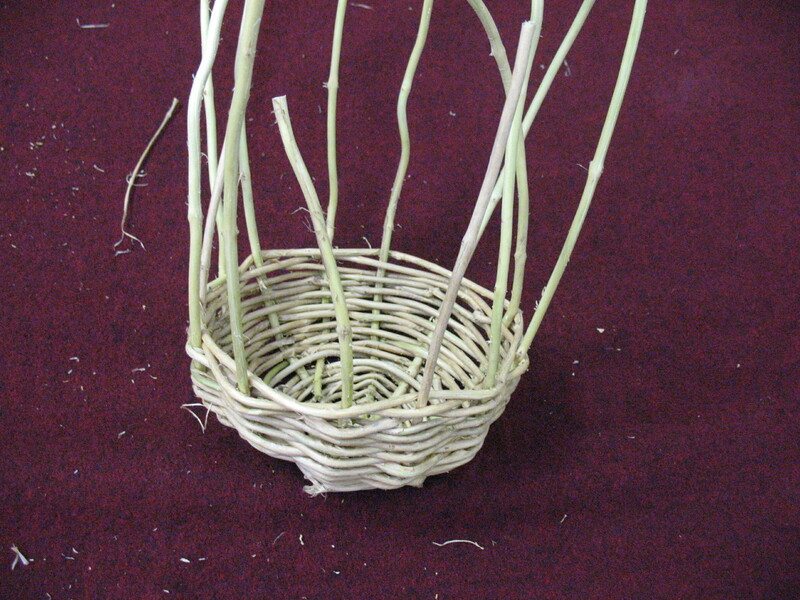 So let’s learn how to make a simple basket. 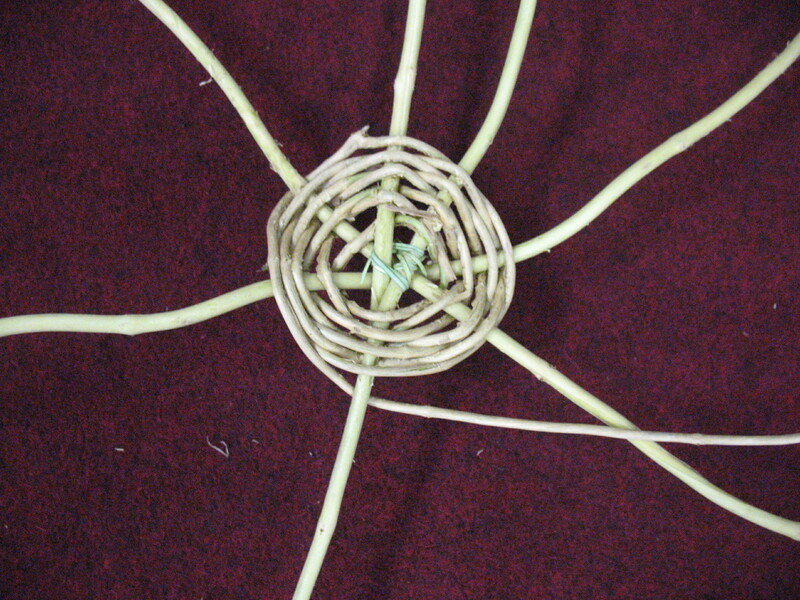 Basket making is one of man’s oldest household skills. Baskets were manufactured for thousands of years before the development of ceramic pottery making. 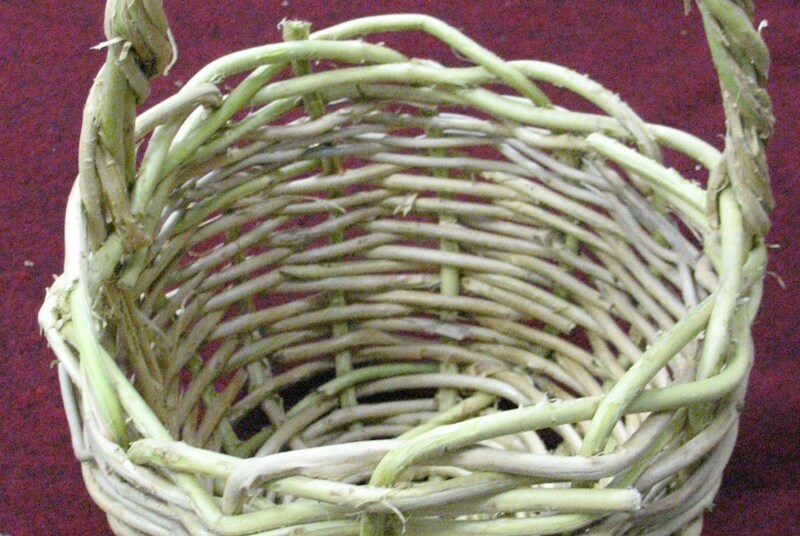 Some cultures took basket making to such a level that they could actually weave watertight baskets. 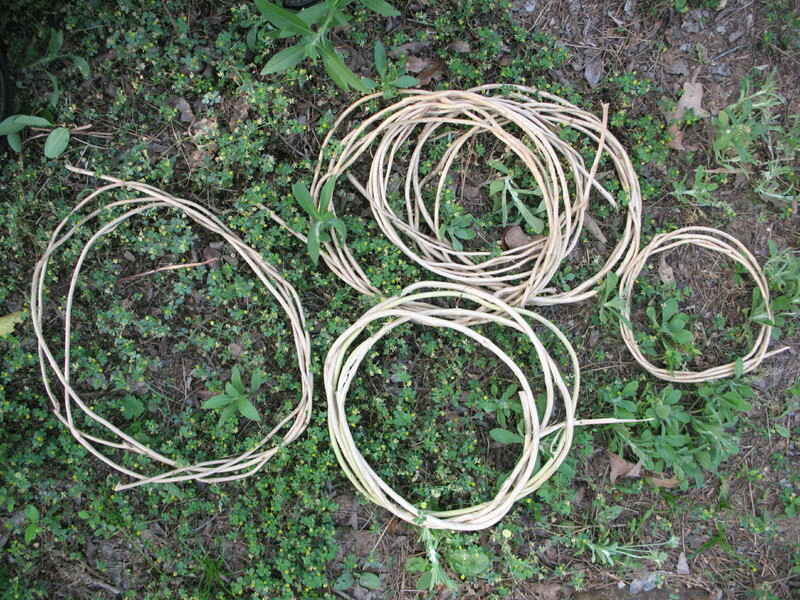 I certainly don’t have anywhere close to that level of skill, but I can weave simple baskets to use for gathering and storage; and one of the simplest types of baskets to make is the woven honeysuckle basket. Give this skill a try and you will probably find it fun and easy to do. If you want to remove the bark from the vines you can peel it off pretty easily from the fresh cut vines. 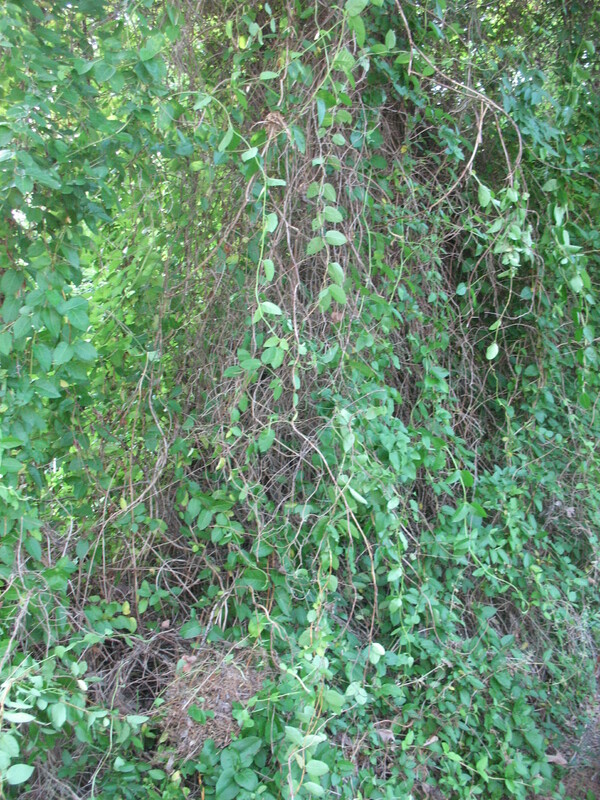 If the bark has already set you can toss the vines into a big pot of boiling water and boil them from about ten minutes. Take them out, let them cool, and most of the bark will peal off easily. Now take your freshly soaked vines and let’s start on our basket. We’re going to make a gathering basket that is about ten inches across at the top and eight or ten inches deep. 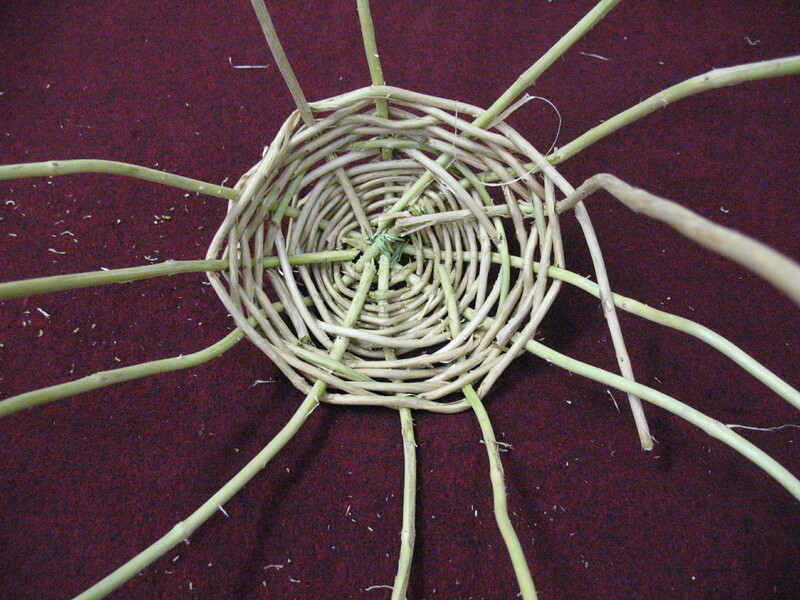 The first thing that we need to do is lay out the ribs (called “warps” in basket making) of the basket. You will need to select some of the larger and straighter pieces for the warps. These should be from 3/8 to 1/4 inch in diameter. You will need three pieces that are about 30 inches long and one piece that is about 18 inches long. You see, to make a woven basket you need an odd number of warps (in this case we’ll have seven). If you have an even number of warps you will end up going over and under the same warp with each layer of your weft (this is the vine that you weave around and around the basket). This sounds a little confusing, but you’ll see right away what I’m talking about. 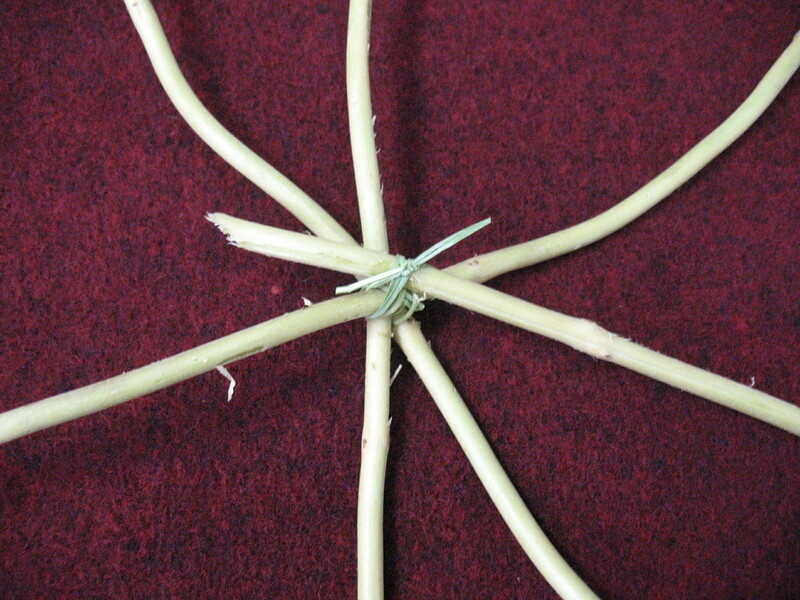 Take the three longest warps and lay them down crossed in the center. Take the short warp and lay it down in the “V” formed by two of the long warps. Lay the short warp so that it has about 15 inches on one side of the crossed warps and about 3 inches on the other side. When you have the basket completed to the height that you want, it is time to finish out the top. To finish the top you will need to trim off the excess portion of the warps and bend the warps down to insert them into the holes next to other warps (this will become more clear in a moment). The point is that we are going to be bending the warps rather sharply, and since they are pretty dry at this point, the may snap. 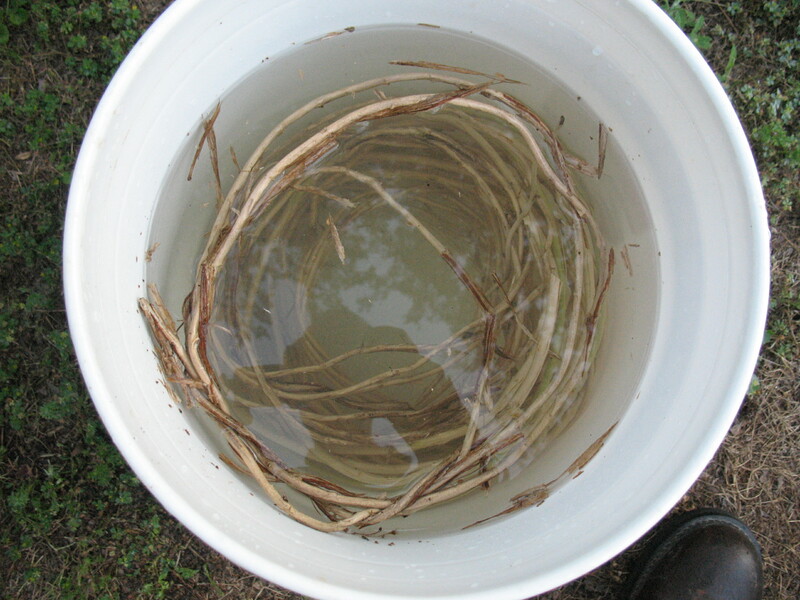 To prevent the warps from breaking, it is a good idea to soak the basket in water for an hour to make sure that the warps are soft and pliable. If you want to make a handle, leave two warps that are on opposite sides of the basket standing up. Weave the rest of the warps down as above. Now take the two standing warps and bend them down toward each other. Insert the ends of these two warps down into the hole next to their opposites. You should now have a handle of two warps that lay side-by-side. 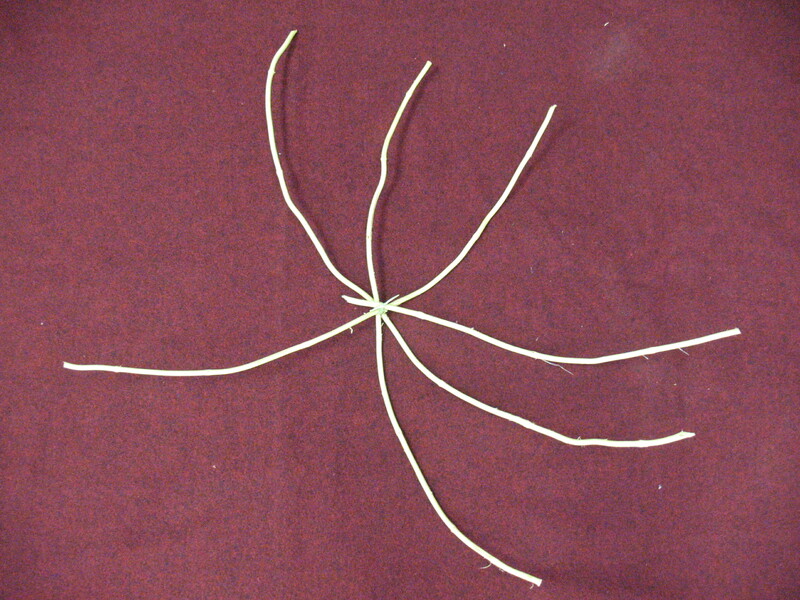 You’ve now completed a simple woven, honeysuckle basket. Time to go out and gather some wild berries. This is awesome. How perfectly simple and effective – I love it. Thanks for the detailed description and pictures! I have always wanted to make a basket, now I have no excuse not to! TY SIr! As alternative method, instead of mucking about with however many vines/strands all at different angles try using two groups of three perpendicular to each other. 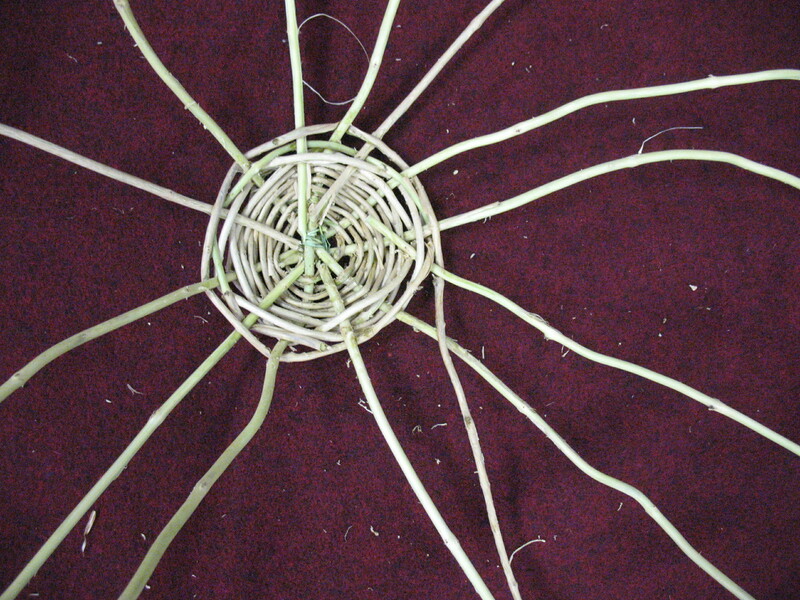 It makes for an easier start and you just splay the vines to the desired angles as you continue to weave.